Motor Trend is reporting on a number of details on future Infiniti product, including a possible 530 horsepower Super G. From the article by Pete Lyon, the Infiniti insider says that the Super G will be built at the Tochigi plant, the same plant where the Nissan GT-R is built. Infiniti is probably looking to tie a little of the Red Bull F1 relationship, and naming on those cars. So far they have annouced a Sebastian Vettelized FX, but something like a Super G would make a lot more sense than an SUV. Q. 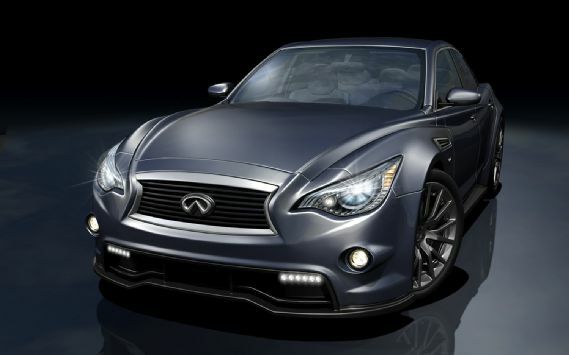 Finally some real performance from Infiniti. And where will it be built? A. It'll only be built at the same plant as the Nissan GT-R, our Tochigi plant. I think our marketing types want to create a special high performance "Tochigi brand," as this will be the only place where the GT-R and IPL engines are basically hand-made. Tochigi will come to mean "a unique brand of Japan-made performance, luxury and quality." Q. What about pricing? Won't this IPL be expensive? A. The 530-hp IPL-spec G will probably be priced at around the same price as the GT-R if not a fraction more. Given that the basic C63 AMG costs (in Japan) around 10 million yen, that is where the IPL will be priced, I feel. Q. And finally, any more surprises? A. One more. Remember the Infiniti Etherea hatchback concept from Geneva? Its styling might be toned down a little for the production model, and it will employ Mercedes MFA (Mercedes Front-drive Architecture), but you can expect to find it powered by a Nissan-built 2.5-liter, four-cylinder, supercharged hybrid. That's the QR25DER series engine and is the only powerplant being considered for that car at the moment, a vehicle that will be built in Austria by Magna Steyr. Head over to the Motor Trend blog post, for the full interview.